Historisk fullt møblert leilighet med 1 soverom 500 m fra sjøen på den vakre franske rivieraen. Beliggende i en rolig del med brosteinsbelagte gatene i gamlebyen i Antibes, like ved Picasso Museum 2 minutter til ferskvaremarkedet, deilig mat og barer. 5 minutters gange til Antibes port. 1 bad med separat toalett. Åpen kjøkkenløsning og stue. TV, air-condition og 24 timers WiFi. Kort sikt, 2- 6 måneder eller 12 måneder ekstra. Stort bad med badekar / dusj kombinasjon, servant, speil, vaskemaskin, hårføner og skapplass. Separat toalett. The apartment was cosy and stunning as described.Very clean and provided almost everything you need as your home.Close to the beach, restaurants ,markets etc....We would love to visit again. Thank you both for giving us the opportunity to host you. We are so glad that you enjoyed your time in Antibes and the apartment. We pride ourselves on the fact that not only is the apartment in such a incredible location, but also that the apartment it's self has so much to offer, including its worldly charm- as the historical monument it is (Porte De L' Orme). It is everything you need for a wonderful vacation. We hope to see you again soon!!! And wish you all the best for the rest of your travel. 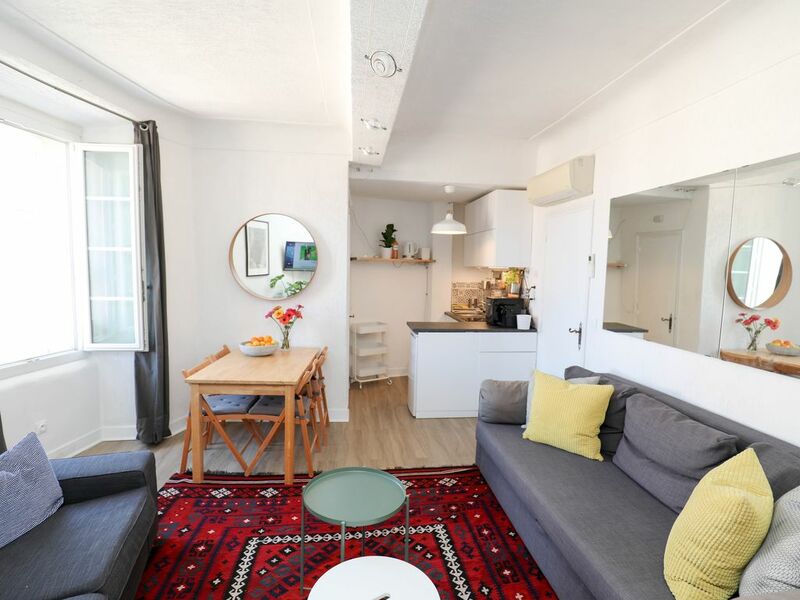 Nice small apartment in old Antibes. To really experience the charm, authenticity and quality of life which Antibes presents to its visitors, it would be difficult not to appreciate Le Bonheur! Location, ambience and comfort all rolled into one- what more could you want. Rest assured the tower window wil be drawing you to watch the world of the old city evolving daily and into the night. For us, we have been spending part of our yearly life here in Antibes for 30 years and we will return to Le Bonheur again if Micaela (and Cathy) will permit. We are so glad that you enjoyed the location, ambience and authenticity of Antibes and our apartment. Having the ability to enjoy the comfort of the apartment and knowing that just a few meters from your door step, is the magnificent fresh project market, Marche provencal, the breathe taking Côte d'Azur as well as the wonderful variety of restaurants which surround you. We look forward to seeing you for your next Antibes vacation. A perfect location and place to experience Antibes old town! Great property. Easy to deal with owner and manager. Thanks! Dear Micaela, it was a wonderful week in your nice and well equiped Apartment! Whenever we come to Antibes again, we would like to stay there again - it was like beeing at home! Thank you for taking the time to review your stay with us, and communicating how much you enjoyed it. We really look forward having you back at the apartment again soon. Gamle Antibes: En historisk perle, Gamle Antibes er et populært reisemål for turister som ønsker å få en smak av den lokale kulturen når de vandrer rundt i de attraktive torg og små smug fra sine Antibes villaer. Lokke og røre Antibes forblir innen gangavstand fra en feriebolig i gamle Antibes. Kunstelskere bør ta en tur til Gamle Antibes, det beste stedet å kjøpe lokal kunst, som har vært så viktig for Antibes historisk. Cap d'Antibes: La Garoupe-stranden er verdenskjent og fyrtårnet tilbyr en spektakulær utsikt over dette fantastiske feriestedet. Turister som bor i feriehus i Antibes er omgitt av et bredt utvalg av ting å gjøre. En av de mest kjente museene i området er Picasso Museum (Musee Picasso), som ligger i det historiske Chateau Grimaldi. Museet inneholder en av de mest omfattende utstillinger av Picassos arbeid i verden. Historie elskere vil nyte Museum of Archaeology, kartlegge den rike historien til regionen.